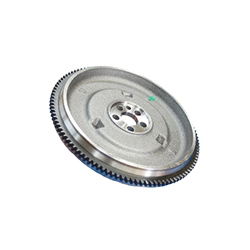 Flywheel is a rotating mechanical device that is used to store rotational energy. Flywheels have a significant moment of inertia, and thus resist changes in rotational speed. The amount of energy stored in a flywheel is proportional to the square of its rotational speed. Energy is transferred to a flywheel by applying torque to it, thereby causing its rotational speed, and hence its stored energy, to increase. Conversely, a flywheel releases stored energy by applying torque to a mechanical load, which results in decreased rotational speed.